And thank goodness we finished uploading the 1st batch! 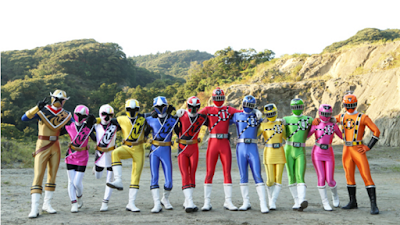 Enjoy this clips from the recently released team-up movie, Shuriken Sentai Ninninger VS ToQger the movie! Seeing this many colors in on straight line makes me crave some 4 seasons juice! And yeah, enjoy the debut of the animal team in this movie too. Stay tuned boys and girls, the second batch will be up in just a few moments. Just taking some time uploading the vids. Why would it not happen? Next year it will. Because Zyuohger is 40th Super Sentai, the VS movie for Zyuohger later is Doubutsu Sentai Zyuohger vs Super Sentai.